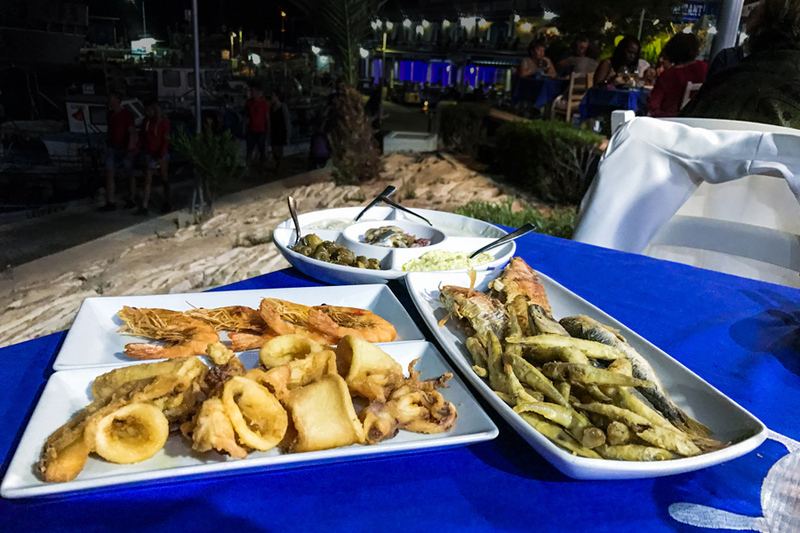 Food in Cyprus will certainly please the gourmand types and thrill their palates, with flavors that they have not tried before. In Cyprus people know how to eat and, at the same time, enjoy themselves with their company. This, of course, is assisted by the Cypriot Mezedes. But what exactly is this? 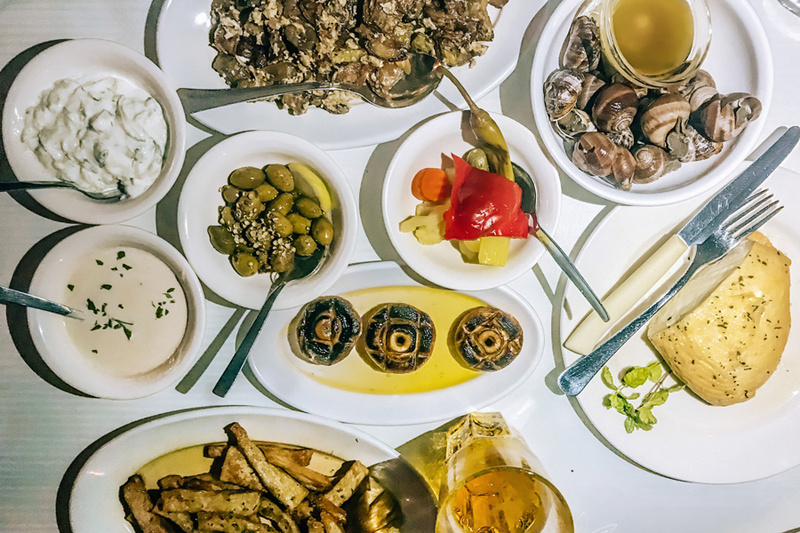 The Cypriot Mezedes (appetizers) are present in almost every shop of the country and they are specific dishes of medium size with many local appetizers, local dishes and local sauces! The minimum number of persons is two and the number of dishes ranges between 12 and 20!! They only thing you have to say is… “Mezedes for two” and they will get it! Restaurants on the island are many, with most serving quality food in reasonable prices. 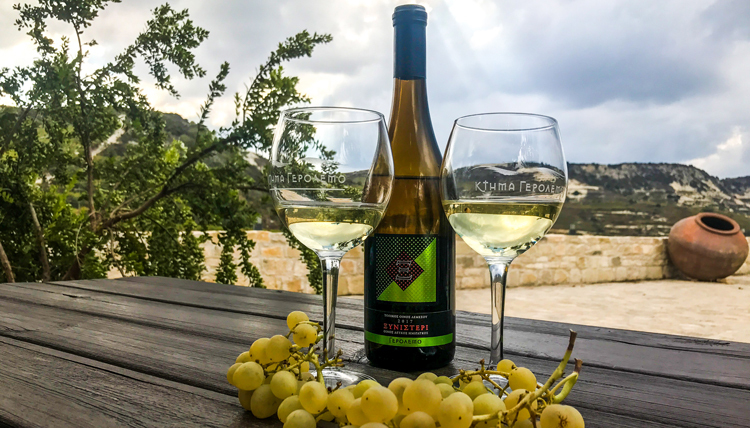 For a two-person meal you will pay 40-50€, accompanied by the wonderful local wine ksinisteri, while the cost for the mezedes starts at 15€ and can be as high as 22€ per person. 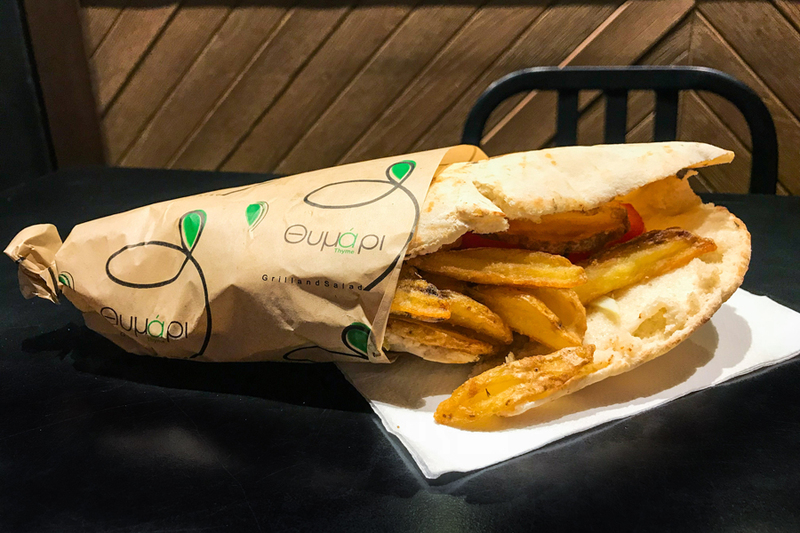 But in Cyprus you will also find plenty of fast food options, with the most known being the souvlaki with Cypriot pita and the Cypriot koupes, a kind of crispy snack with bulgur and winced meat or mushrooms. It is worth mentioning that on the island they love legumes in all their forms (soup, baked, sauce and in salads). All of the above are accompanied by the Commandaria PDO wine! 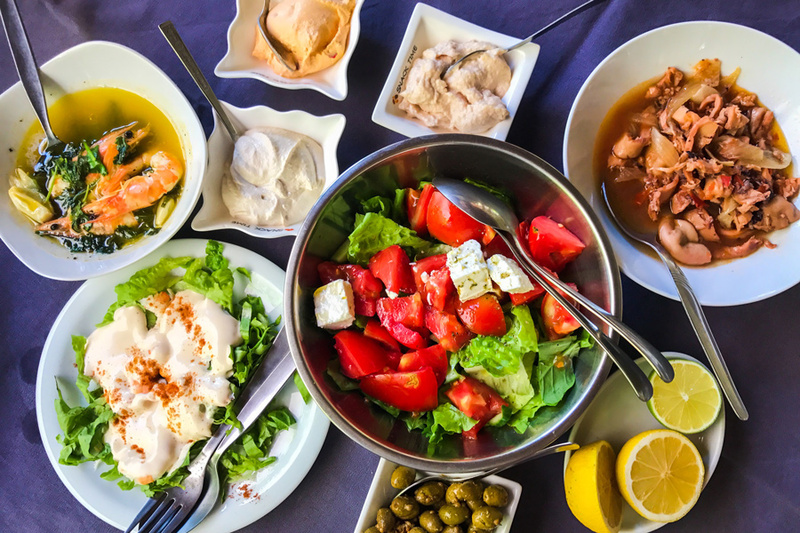 Do not make the mistake of leaving Cyprus without having tried the amazing Seftalia, our beloved halloumi, (fresh-boiled-baked-dried…), Ofto kleftiko (lamb) that melts in your mouth, warm or cold koupepia (dolmas-stuffed leaves with rice and minced meat), pourgouri with tomato, aphelia (pork) and fried poules. 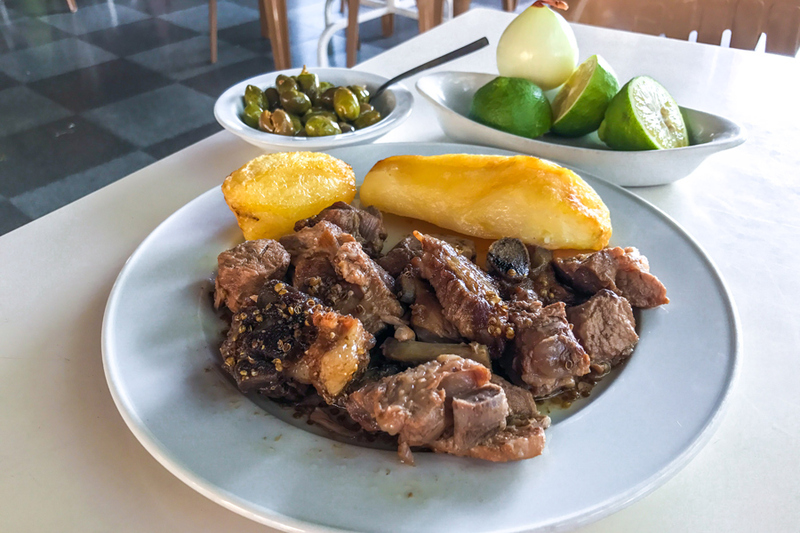 Finally, try the kolokassi (taro vegetable, kind of potato) ragout or with pork and sweeten up with the delicious bananas from Paphos or with warm anari (unsalted cheese used for desserts) sprinkled with cinnamon. Notes: a) You will find Cypriot Mezedes in grill-tavern, in fish taverns as well as in vegetarian restaurants. b) Cypriot Mezedes (for two or more persons) are more than sufficient, if you are thinking of ordering anything else! 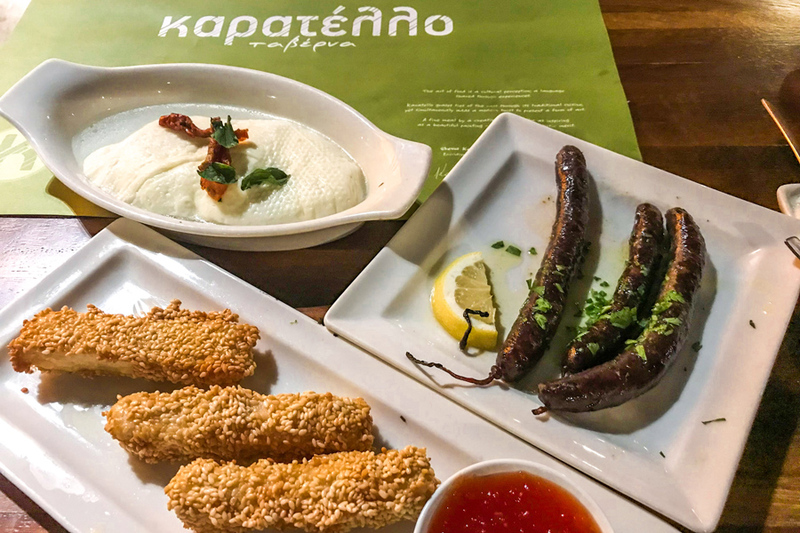 Karatello is one of the best restaurants in the entire Cyprus. It is located in the old town of Limassol and serves the most delicious Cypriot mezedes in the city. Flavors are excellent, dishes are high-quality, the plethora of appetizers is more than enough and prices are totally reasonable for what is offered! 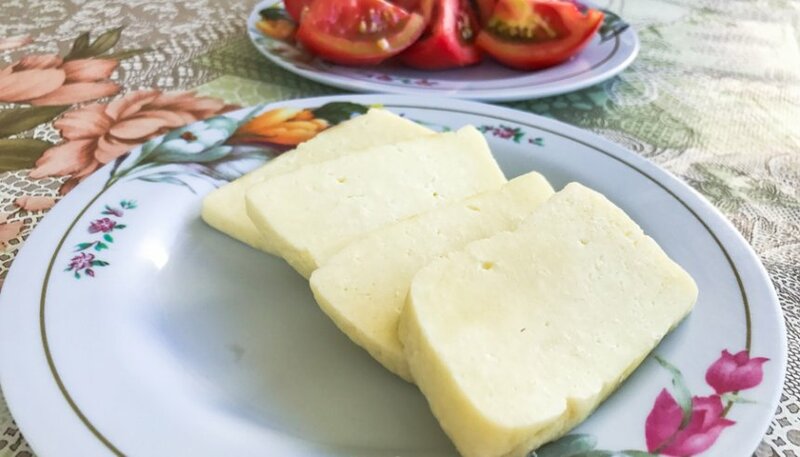 Do not miss out on trying the boiled halloumi! MUST-EAT. Our suggestion: The boiled halloumi (dreamy). 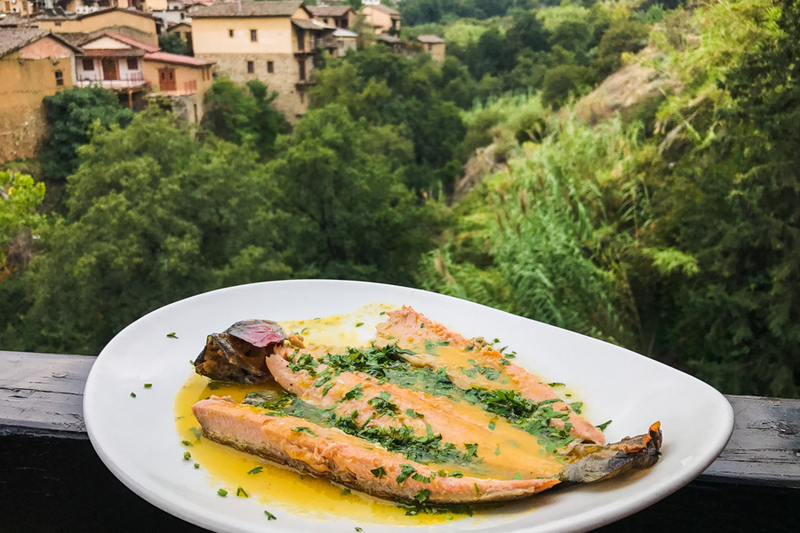 In the beautiful village of Kakopetria you will find a restaurant that is famed for its trout! Mylos is located on the veranda of the top floor of the homonymous hotel and it is widely known not only in Cyprus, but also in other countries. The rest of the dishes are also tasty, but they come to second place compared to the pink trout fillet with the heavenly buttery, sour sauce…! Prices are a bit high, but completely reasonable for the quality and quantity of the dishes. Note: It is necessary to make reservations! Our suggestion: the unparalleled Trout. 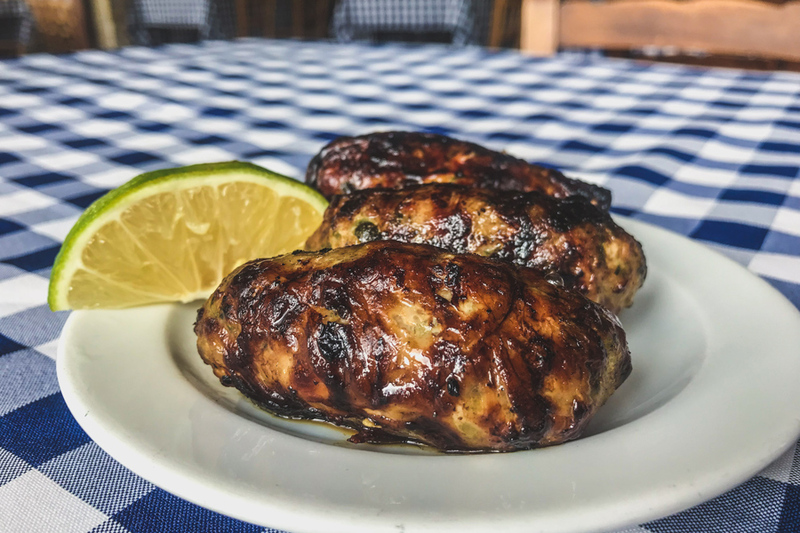 In the village of Sotiras, 10 minutes away from Ayia Napa, you will find a gem of the Cypriot cuisine, the tavern Mousikos! The plain space, Greek music and quick service come to compliment the many delicious Cypriot dishes that the tavern offers. Dishes made with good ingredients and cooked in a traditional way! Of course, the menu includes the well-known Cypriot mezedes with a plethora of flavors. Our suggestion: The Ofto kleftiko casserole. Limassol’s jewel, the wonderful Pier1 is located on the city’s old port. 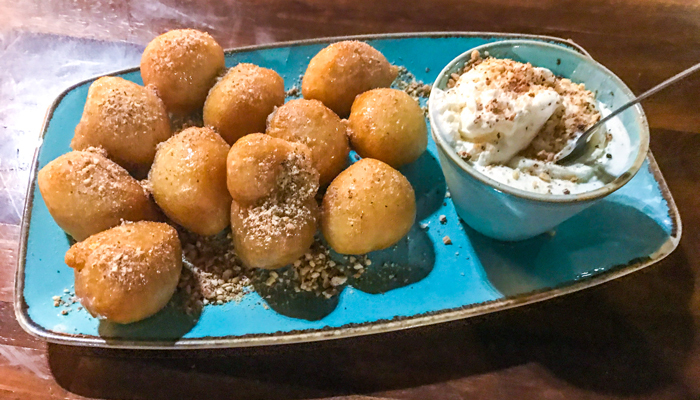 It is one of the few restaurants in Cyprus that do not serve Cypriot mezedes, but the selection both in salty and sweet dishes will astonish you. The staff is very polite and prices are proportionate to its quality and location. Our suggestion: The legendary Choco-bomb. The restaurant Vassos Psarolimano is located in front of the beach of Ayia Napa. When you are there, the option is one-way…Fish. Fresh fish, to be exact. The restaurant also offers Cypriot fish appetizers with a wide variety of dishes and pretty good service. You will certainly have to make reservations, as the restaurant is almost always full (mainly during the summer months). Our suggestion: the fresh Cypriot fish appetizers. The wonderful yard of Dionysus Mansion will offer you many tasty evenings in Limassol. Inside its beautiful outdoor as well as its indoor space, they serve amazing flavors from the Cypriot, but also European cuisine. Cypriot mezedes are present in this restaurant and are accompanied by pleasant service and reasonable price. 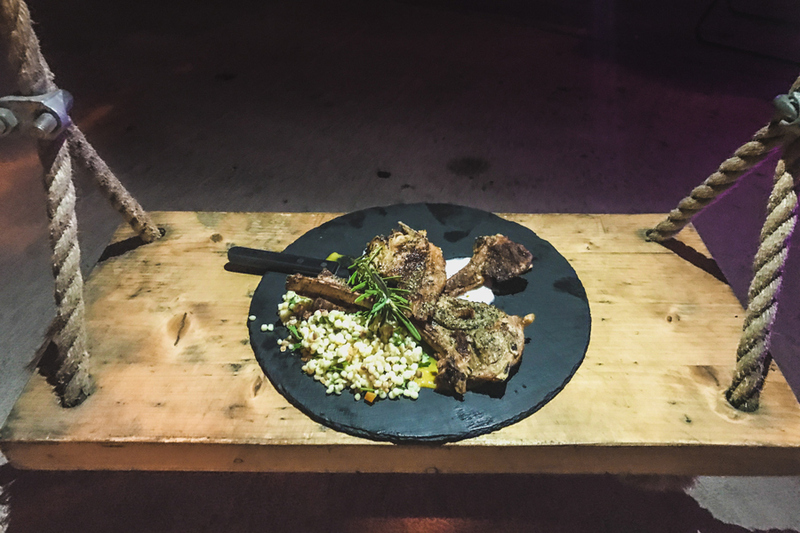 Our suggestion: The mouth-watering chops. 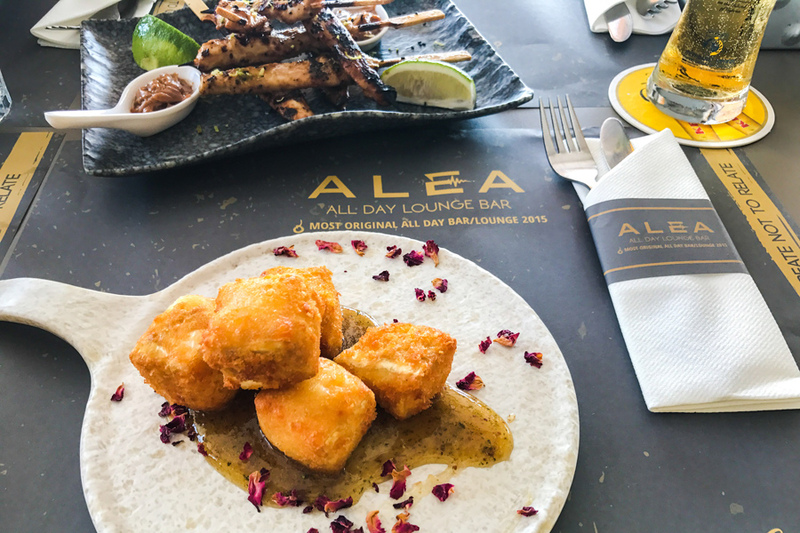 Coastal, with tasty dishes and wonderful decoration, Alea Lounge Bar will swiftly get in your hearts. 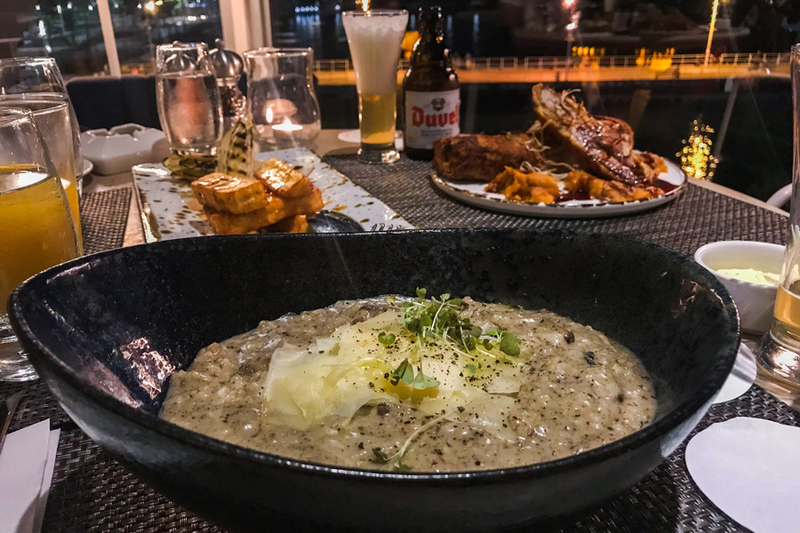 It is located right by the sea, on Paphos’ waterfront and has a wide range of fast dishes, such as burgers, toasts, sandwiches, salads and a few main dishes. All dishes can be combined with the light traditional KEO beer or with one of its cocktails. Prices are reasonable and service is very polite and quick. Our suggestion: the healthy cold salads with Legumes. Thymari is one of the most well-known and high-quality fast-food establishments in Limassol. It is located on a central street at the city’s old port and serves tasty souvlaki, seftalia and other meat delicacies in Cypriot pita, but not exclusively. Sandwiches might not be large, they are however very tasty and at a reasonable price –for Cyprus-. The shop is ideal for before or after the all-nighter in always-lively Limassol. Quiet, beautiful and picturesque, the tavern To petroktisto is located in a non-tourist spot of Limassol, pretty far from its center. The cook and owner of the tavern serves delicious fish-delicacies and Cypriot fish appetizers. Prices are reasonable, service is quick and options are many. Our suggestion: The Cypriot fish appetizers. Vassiliki Restaurant is next to the historical site of Chirokitia, between Limassol and Nicosia. The restaurant has been a necessary stop for hungry drivers for years. Miss Vassiliki prepares numerous Cypriot dishes that are plain in appearance but full of flavor. Options are based on meat and legumes, while prices are pretty low. Our suggestion: pork Aphelia that melt in your mouth. The tavern Makrynari is located in the mountainous village of Omodos and it is one good option for food. It offers plenty of dishes, as well as the well-known Cypriot mezedes, which are satisfying in quantity and taste. The food is often accompanied by live music. Our suggestion: eggs with zucchini. 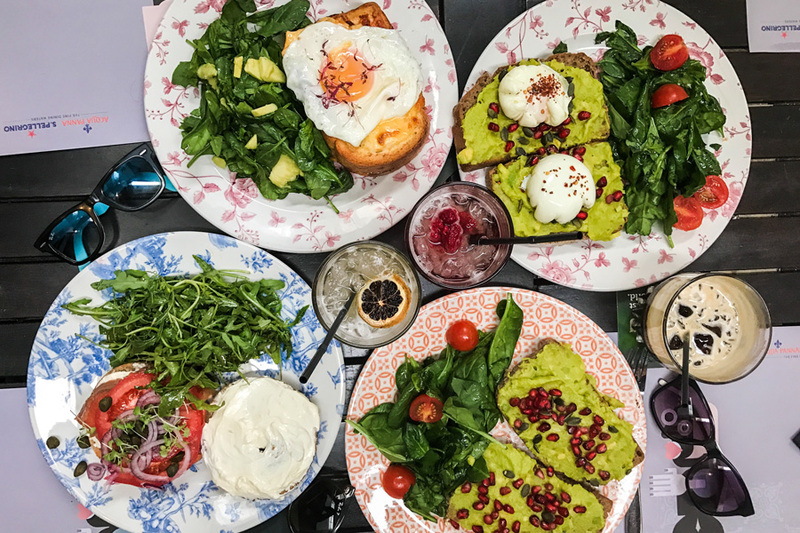 The brunch café Mouson is located in the heart of Nicosia, on a very central pedestrian street and serves colorful options for breakfast and brunch. It is heavily influenced by the European culture and this is prevalent through its dishes and decoration. Modern, with good food, coffee and freshly-squeezed juices, this café will become your hangout spot. Our suggestion: the tasty Croque Madame. While searching for some quality breakfast and good coffee in Larnaca, we came across To Kafe tis Chrysanthi’s! Inspired by the well-known Greek series “To Kafe tis Charas”? Maybe! The point is that this beautiful little gem will fascinate you with its fresh breakfast delicacies, as well as with the politeness and quick service. The one taking care of the dishes is Chrysanthi, who is usually inside the kitchen. 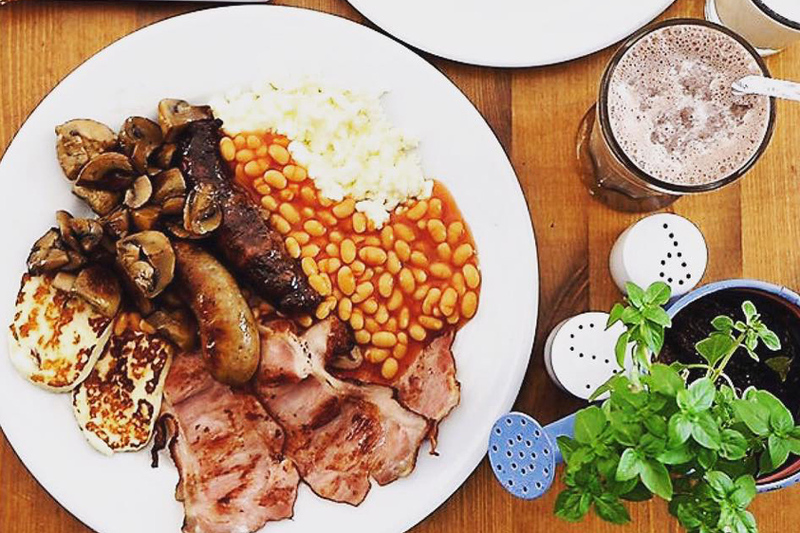 Our suggestion: the calorie-rich Cypriot breakfast.